The EnduroSharp™ Scraper Blade Sharpener is a durable hand-held portable sharpening fixture used to sharpening the EnduroSharp Torlon Scraper Blades (TSB) tools. 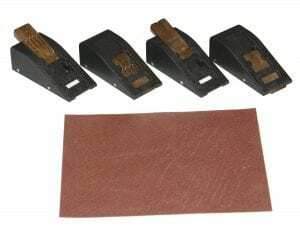 The sharpener along with 120-180 grit sand paper, allows for quick sharping of the TSB tools, while maintaining the 25⁰/25⁰ asymmetrical 1/3-2/3 cutting edge. 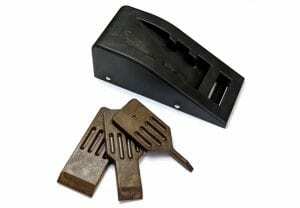 The simplistic compact design enables the operator to sharpen the TSB tool, while on the job site without the need for additional support items. 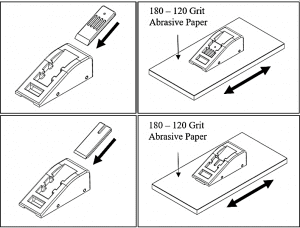 This process instruction is designed to provide instructions for the restoration of the cutting edges of the EnduroSharp Torlon Scraper Blades (TSB) shown in Figure 1. Prior to use, ensure the TSB cutting edge is sharp and its as-manufactured asymmetrical configuration with 25 degree cutting angle is maintained. A reference line is located on the long edge of the TSB to serve as a guide when sharpening to facilitate maintenance of the original cutting edge configuration. See Figure 2. Sharpen the TSB using the sharpening fixture shown in Figure 3. 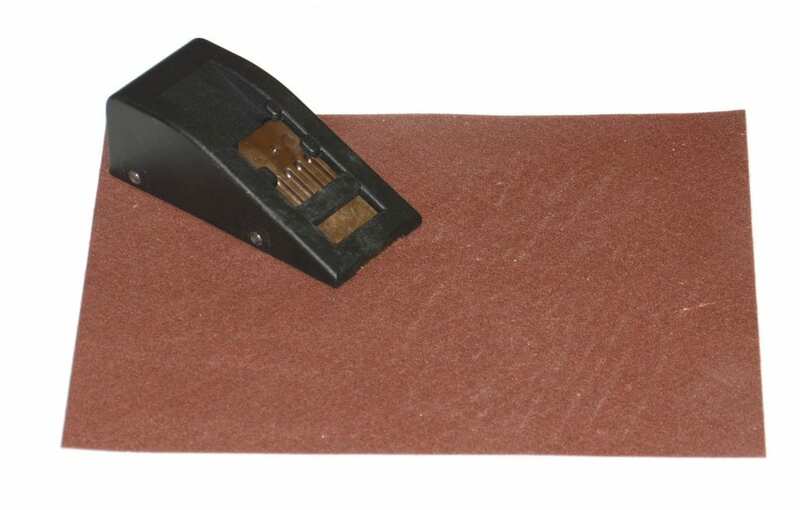 Insert the TSB into the sharpening fixture and place the sharpening fixture on the 180-120 grit abrasive paper that has been positioned on a on a flat surface. 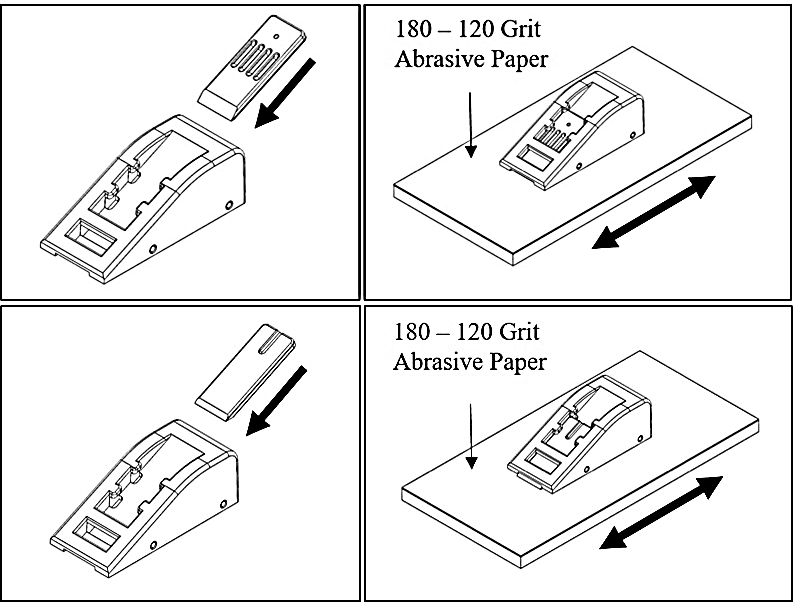 Slide the TSB into the sharpening fixture until the blade makes contact with the abrasive paper as shown in the top right view in Figure 3. With the TSB held firmly in contact with the abrasive paper, roll the sharpening fixture back and forth across the abrasive paper. Alternate between the top and bottom side of the TSB when sharpening until the cutting edge has been restored and is aligned with the reference line shown in Figure 2. 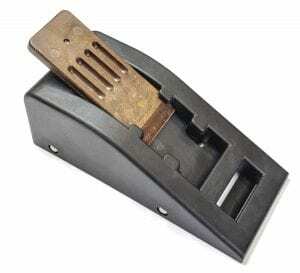 NOTE: Repeat the sharping process as necessary to maintain a sharp cutting edge during the material process.